Throughout history, music has been the focal point of all gatherings. Whether you are look to go to a concert, or simply doing projects around the house, there always seems to be some for of music playing in the background. Rather than dishing out hundreds upon hundreds of dollars to attend all of your favorite bands’ concerts, why not bring a little bit of them into your man cave? Rock music memorabilia is present in numerous facets, but finding them or deciding what there is to get can be a bit tricky. Let us take a look at some of the best options and best sites to get you those unique items! 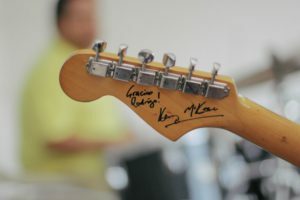 Whether you are a fan of guitars, drums, or other technical instruments, there are a variety of options out there with concert used or artist signed instruments. With Rock music being around for a century, there are artists of all eras out there who took to their fans and signed various musical instruments to help you, the fan, bring a little of their rock to your very own man cave. One of the best man caves I have seen is from a guy out in Ohio who is a fan AC/DC and the Rolling Stones. He went online (to one of the sites linked in my above post) and purchased a signed base guitar and electric guitar from AC/DC. After receiving them and making sure they were exactly what he paid for, he went back online and purchased 4 cymbals and 2 drums from the Rolling Stones. Now imagine this – a man cave with a whole set of musical instruments signed on your wall, instruments signed by your favorite musicians that are your own. Not only does he get to relive the euphoria of his favorite bands and/or concerts, he gets to have his friends bask in his epic memorabilia. There is nothing that can top signed instruments, however the next section covers a few things that come pretty damn close. If you have limited wall space for your man cave or man shed, having a wall of signed instruments may be out of the question. 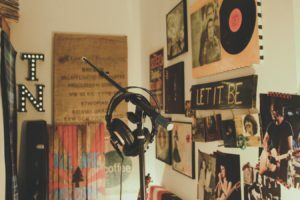 Luckily for you, there are other options to help boost your music themed man cave – like framed records or albums that have been autographed by the musicians themselves! We have all seen the reality shows or movies with musicians and producers talking with their platinum or gold records behind them. There are similar items out there now, with music artists being more fan friendly and willing to autograph anything upon request. If you take a look at the review above, you will see the best memorabilia for records and albums that have been signed by some of the best musicians out there. Imagine having an autographed Queen album, autographed Nirvana record, or any other artist. Now that you have access to these two sites, you no longer need to imagine this – you can make it a reality! With wall decor options covered, let us take a look at some furniture options! Music themed furniture is always a hit or miss, as there is no set piece that relates to music alone. However, there are a few custom options that counter this mindset and allow you to set up different furniture pieces with the ideal talking points of music and rock! 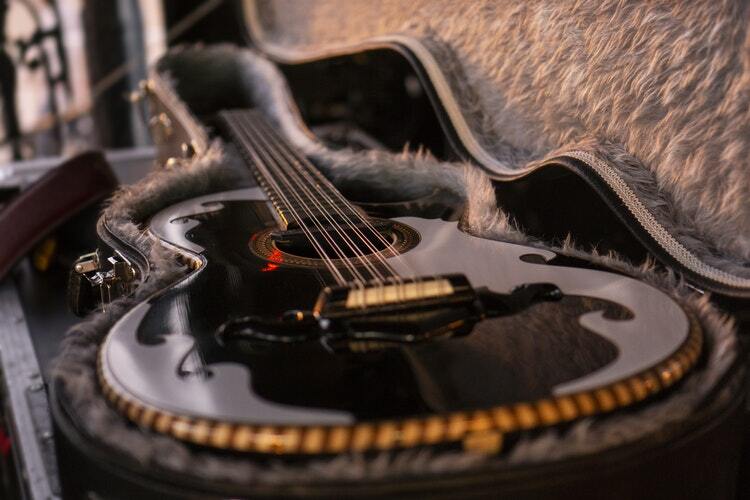 Imagine a lamp with the base being the neck of the guitar. Or, you could have light switches as a guitar head stocks. Using these same concepts, you could create or purchase couches and chairs made from different band memorabilia. Bar stools are easy, as you can have custom cushions with rock band logos. If you wanted a little flair in there, you could use a drummer’s seat as your bar stool and create an added flair to your man cave or man shed. Converting one of these drummer chairs into an end table would be easy as well, as adding a glass topping would enable an effect in which you and your guests could utilize the end table and still see and feel the ambiance of music. Leather furniture typically appeal to the rock themed man cave, as a lot of back stage areas incorporate leather couches and chairs. However, there are other options as well! A lot of rock bands use props and LED lighting that give the atmosphere an overall industrial look – why not bring that to your man cave? There are a lot of options out there that will enable you to get that industrial rock feel for your furniture without breaking the bank. If you are unsure of where to start, take a look at my post HERE for the two best sites and see what they have to offer. Furniture and wall decorations are covered, but are we missing anything else for your man cave? Your bar and bar accessories are a huge part of your man cave, so let us dive into what options are available for you to up your rock themed man cave bar! Before we fully immerse ourselves into rock themed bars, I want to reiterate what I targeted in a prior post – LED lighting for your bar is exception and can give your bar the ultimate feel for a rock theme. Take a look HERE at our best LED lighting options review for your man cave bar setup. With the lighting down (and bar stools from a prior section), let’s focus on your drinks and mugs. 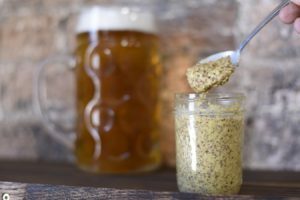 With options of steins, mugs, growlers, glassware, and many more, there are a variety of different options on what cup options you can purchase to supply your bar. I highly recommend heavy glass mugs, as rock stars need to drink beer with authority, not with style or fruity elegance. With your glassware ideas set, now you can look for different custom options that pertain to whatever band or bands you want to promote in your man cave or man shed. KISS, AC/DC, Queen, Fall Out Boy, or whatever band you follow or love; there are so many places to go find these mugs and get the ones that work for you. Adding a little variety of bands is always a plus though, as most of us like more than one band in our life. So we have our autographed wall decorations set, our furniture ideas started, and our bar drink ideology set up – so what is next? Where will you start first? Whether you are looking for signed instruments, autographed albums or records, custom furniture, or rock themed cups, there are a variety of options out there that fit your need. I hope this helped narrow down a few ideas and give you a place to look up these items you are looking for without spending hours upon hours looking around the internet. If there is something in specific you are looking or something you found on here that you purchased for your man cave, comment in the section below and I would be happy to reply! Hey Andrew, your post is awesome. I learned so much regarding your post like the rock music memorabilia that goes beyond signed guitars and t-shirts. So do you have anything signed by anyone from the rock and roll generation, if so, what is it and do you still have it today? Also, I like how you talked about the memorabilia being a good thing to have in a man cave because it is important to have that important piece of history hanging up in the only historical place of any significance and that’s the man cave. Good job on the post! Hi RJ, I do have something signed, a guitar signed by ZZ Tops! I am a huge fan of older rock and ZZ Top happened to visit town and we had a mutual friend. It is rare to see such a blue collar group of people, but they all were willing to sign the guitar and I keep it to this day. Thank you for the read and I hope you get your man cave items and find that special rock music memorabilia.